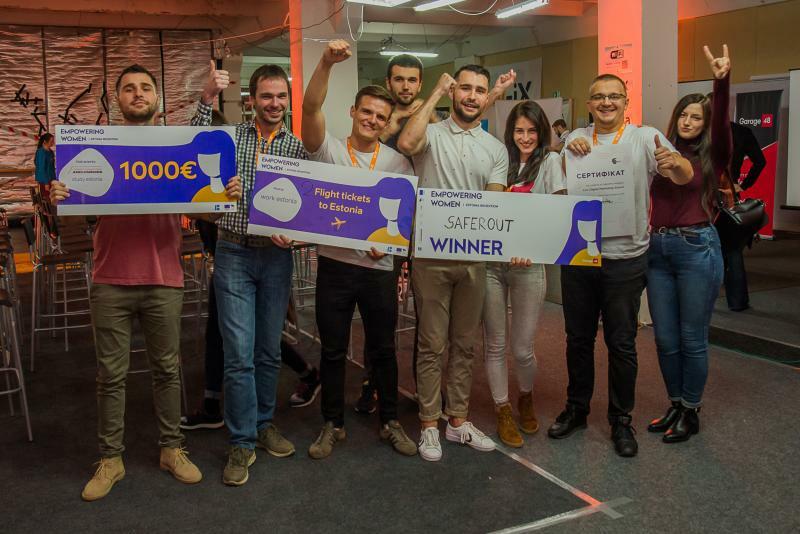 On November 2-4, Foundation Archimedes and Garage48 took over Lviv for an Estonia 100 Edition hackathon to encourage more women to get involved in IT, tech and entrepreneurship! The Empowering Women – Estonia 100 hackathon in Lviv hosted so many diverse minds coming from inter-disciplined and multi-cultural backgrounds only with one thing on their minds: making an impact through a life-changing idea! On Friday evening, our host and superstar Ragnar Sass kicked off the hackathon, with an emphasis on the massive potential of Ukrainians regarding going the extra mile to achieve more in life. All participants were given the opportunity to focus on any idea they want, work on any solution they desire – the only focus was to encourage more women to choose the entrepreneurial path and inspire them to become whatever they hunger. That night, 17 ideas were pitched and 16 of them found teams. By Saturday evening, only 15 teams could survive the intense atmosphere of a hackathon. The event was bursting with innovative ideas and the vibes were sensational! We had more than 100 participants and half of them were women! In order to empower women, though, we need to listen to what they want. And that’s exactly what we did, while the teams were non-stop working on their solutions during 48 hours. “We came to participate as a team because we have had this idea for a while now but we have been looking for an opportunity to focus on it intensely and build the product finally. This hackathon seemed to be the right place!” said Yevheniia Mitriakhina from Team E-democracy. “Plus, Estonia being very strong in e-governance also inspired us and title of the hackathon stimulated us to take action!” added Yevheniia. It was truly golden to see all the determination and excitement on participants’ eyes. Long before the final pitches, they were feeling and acting like winners as they seemed to know the most important part of this hackathon: They proved themselves as the survivors of such intense event and they got out of their comfort zones with the aim of making a change in the world. It was simply amazing how they inspired us immensely with their attitudes while it was us trying to do the same for them. We were coming to the end of 48 hours and our 15 teams as sole survivors were getting ready for their final pitches. Our top-notch mentors were taking care of each team closely and preparing them to become winners, through business, tech, design and marketing guidance. On Sunday evening at 17.15, we gathered at the main hall and rang the bells of Live Stream – it was time! Each team was coming to the stage one by one and pitching their final prototypes with utmost confidence and brilliance. Jury was amazed, but they had to pick a winner – or maybe even several! Their idea was to make the roads safer through a face tracking application. Their solution can detect when the driver is tired and about to fall asleep, so the alarm goes on and suggests the driver to stop and rest for a while. The team got awarded with €1000 + All-inclusive travel to Estonia, supported by Archimedes and Study in Estonia, as well as Work in Estonia. Andriy Vahniy from SafeRoad explained that the team came up with the idea on Friday night as a result of another participant suggesting them to go and pitch an idea as well. The team members knew each other and they were there to join other teams but they ended up forming their very own team and working on the winner idea. “We took a risk, got in the mood and surely had a lot of fun in the process.” he stated. All members seemed positively surprised to see how things turned out for them. Jaanika Merilo, on the other hand, confidently stated that SafeRoad is a great example to prove that a real product with real impact can be built in only 48 hours. “Even in short time you can do magic” she underlined. Their idea was to offer personalised healthy snack cups to replace junk snacks in the office. For that they worked on an AI based mobile app that would collect and analyze your nutrition needs based on face scanning as well as lifestyle data based on your past activities. They want to connect it with a delivery service to offer one healthy meal per day at least. The team got awarded with 2 tickets to Startup Day 2019, along with a chance to pitch on the stage. All flight and accommodation tickets will be covered. The most important task of the morning is choosing what wear. Their idea was designing an app with smart suggestions on the outfit ideas. The key feature was that it scans all the clothes you have in your closet and makes cool, matching suggestions accordingly, by also considering weather status. Team got awarded with free tickets to IT Arena 2019, supported by Lviv IT Cluster. Team members: Kira Svitlana - UX/UI / Alexander Demianenko - Back-end developer / Pavlo Kuzina - Front-end developer / Luka Yakymchuk - UX/UI / Alex Zholob - Back-end developer / Rinat Botchenko- UX/UI — in Lviv, Ukraine. Their idea was to develop hardware and IT solutions to help local farmers. The product would analyse the problems, monitor the data and offer agricultural suggestions across Ukraine. They got awarded with Tickets to Robotex International Conference+ TalTech Summer School. Their solution will help people learn new languages while watching movies by switching the audio track from foreign languages to native ones in a certain sequence. It would avoid the overwhelming feeling and make the learning process easier, relaxed and more subconscious. They got awarded with $1000 from N-iX and its Open Mind fund. E-democracy offers a platform which consists of general information about politics and politicians for elections from official open sources and mass-media. PropaGanda offers an app that would analyse the articles in the Internet to see if the writer composed some subjective/biased words that might manipulate the audience. Their idea was to develop an app to create personal bucket lists, push people out of comfort zones and empower lives with what really matters. The team got awarded with Tallinn University Summer Tickets + Acceleration Program by LvBS Center for Entrepreneurship. Their idea was to build an Airbnb format for beauty salons. In other words, a mobile app for searching and booking beauty services. The team got awarded with 2 tickets + exclusive place at the Startup Alley at IT Arena 2019. These ladies wanted to build a non-profit organization with an integrated communication platform that connects investors with female business minds, provides updates on female-focused events and pro-bono consulting by industry professionals. The team got awarded with a certificate for 3 months of iHub co-working space. "Brainy": Their idea was to develop a mobile and web app that helps you as your virtual assistant. It provides ability for users to craft their own Brainy for their personal needs. Key feature: AI modules called Cells. "Rocky Mountains! ": It's a social network portal for hikers of any level. It was designed to collect and share all info about hiking routes, required equipment and support to find the best option for the greatest hiking experience. "PetCare": Their idea was to develop an NGO based app to connect animal lovers with shelters in order to help the animals via various ways, including personal care or donation. "Postalee": Their idea focuses on postal address attestation as easy as confirmation emails. "VolunteerX": Their goal is to help the volunteers to find relevant events where they can be useful and vice versa. To implement such opportunity and create mutual benefit, they will create a website for organizations and chatbot for volunteers. Thank you to Estonia 100 for supporting this event and to our partners Garage48 and N-iX for their enormous contribution!